Protect your email addresses from being grabbed by spam bots. Do you list email addresses on your web site? If you do, you must take some extra effort to protect them. Why? Unprotected plain text email addresses are an easy catch for spam bots, special computer programs harvesting email addresses from web sites. Once an email address is collected it gets into an unsolicited bulk email database and starts receiving spam emails. 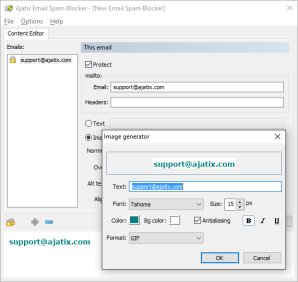 The Email Spam Blocker Expression Web add-in is an effective solution to the email harvesting. It allows to hide email addresses from spam bots, while leaving them readable and accessible to human site visitors. Powerful protection - spam bots never see real email addresses, they are stored in an encrypted form and are only displayed to human visitors. Real people see real email addresses as if they were never encrypted and can click on them to send emails. Valid HTML and CSS - email spam blocker markup complies with HTML, XHTML and CSS standards and passes W3C and Expression Web validity checks. User-friendly Expression Web add-in GUI - GUI is there for you to make style editing as easy as it can be. If you need to change a color, all you do is pick a color, you don't change a hex value in a CSS file. All settings are organized, grouped, and labeled. Live WYSIWYG preview - see how your email address link looks and behaves in a browser, as you edit it. Any change in the style or structure is instantly reflected in IE browser embedded into this window. Unlimited number of sites - use this add-in to protect email addresses on as many sites as you need. Dedicated support team - our support team is more than happy to assist you in resolving any issues.